NXC100for Voice Recognition Assistant Device – Nexell Co.,LTD. NXC100: Sound Beam-forming, Dynamic Noise Suppression and Echo Cancellation for Far-field Voice Recognition. 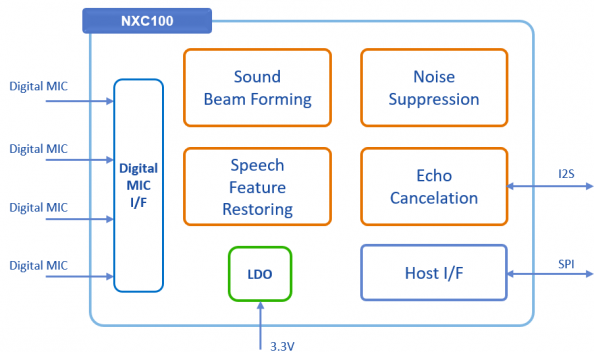 NXC100 is a highly integrated SoC (System-on-Chip) for Voice Recognition Device as like Google Home, Amazon Echo and Apple HomePod. This device is composed of Sound Beam-forming, Noise Suppression, Echo Cancellation and 4 Channel Digital Mic I/F in a small-size single chip. In addition, NXC100 can reduce external component with LDO. NXC100 shows better performance than competitors in pre-processing for voice trigger and natural language recognition not only in barge-in conditions but also in noisy environments. • SPI with Nexell's Application Processors. © Nexell Co.,LTD. 2019. Businessx theme designed by Acosmin.